Somebody needs to tell the groundhog that he really mis-predicted the weather this year. Instead of his projected early spring, we got freezing cold temperatures well into April! Still, Fort De Soto is an awesome place for springtime bird photography, even if there’s wind and cold. I spent a very pleasant evening and morning at the North Beach lagoon and saw all sorts of birds in their gorgeous breeding colors. Incoming! 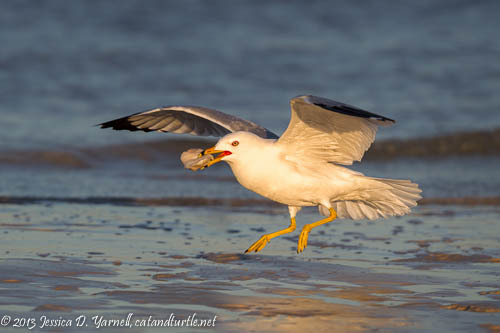 A Ring-Billed Gull brings in his dinner. Fort De Soto. I enjoy trying my lens at landscape photography while I’m at the beach. I’m learning to place elements in the foreground to add interest to what would otherwise be a straight horizon with an orange orb. I liked how the sea grasses added a “beachy” feel to the image. North Beach Sunset. Fort De Soto. 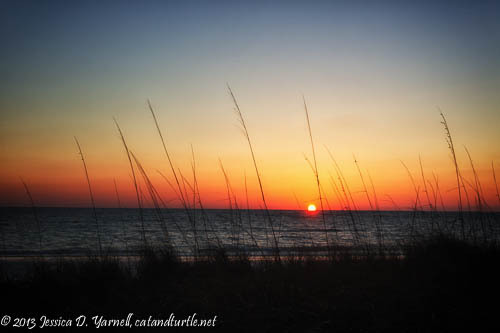 In the morning, I started out at the East Beach turnaround to photograph the sunrise over the Sunshine Skyway bridge. I got there about half an hour before sunrise, and I watched as the sky got brighter and the colors deepened before the sun actually peeked out. I finally got to play with my neutral density filter, a Christmas present from Rich. It let me use a slow shutter speed to blur the water a bit. Thanks, Rich! Sunshine Skyrise. A beautiful place to start the day… Fort De Soto. Since the morning was still windy, I returned to the North Beach lagoon after sunrise. When I first arrived, I saw several photographers, and one bird: a Black-Bellied Plover. He’s still in his basic plumage – sans black belly. Give him another month or so, and he’ll be very black indeed! I hope to get back over to Fort De Soto several times before then, to photograph migrant warblers and maybe get a fully-molted Black-Bellied Plover before he heads to Alaska. 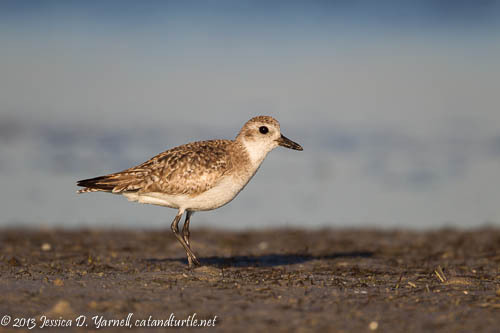 Black-Bellied Plover – The black belly is on its way! Fort De Soto. Standing there freezing cold photographing the lone bird, I was actually debating leaving the beach and checking out one of the other area nature preserves. Then the American Oystercatchers flew in. They are such fun to listen to as they stalk the shores for breakfast. They keep up a constant little conversation between themselves. This is a breeding pair, and I would just love to get some images of their babies. Maybe this year will be my year. 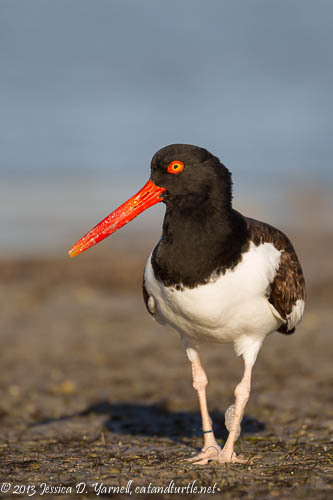 American Oystercatcher – I told him he needs to get busy…I want to see babies! Fort De Soto. The wind blew in a flock of Marbled Godwits, and I stopped thinking about leaving. The tide was out, and they busied themselves fishing in the shallow water. There were at least 20 or 30 godwits in the crowd, along with ever-present Willets who fussed every time they flew in and out. I found a couple of godwits on the edge of the crowd, on a good sun angle. I didn’t realize how many shots had fish in them until I viewed my images on the computer. The fish are so small and they look tiny in those big beaks! 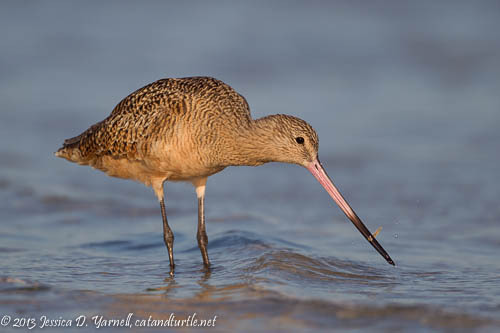 Marbed Godwit – These guys pull the tiniest fish out with those big beaks. Fort De Soto. 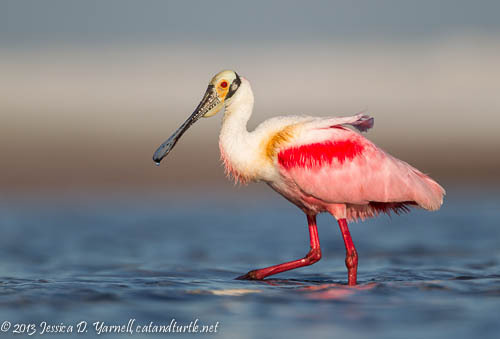 Roseate Spoonbill – Look at those bright breeding colors! Fort De Soto. 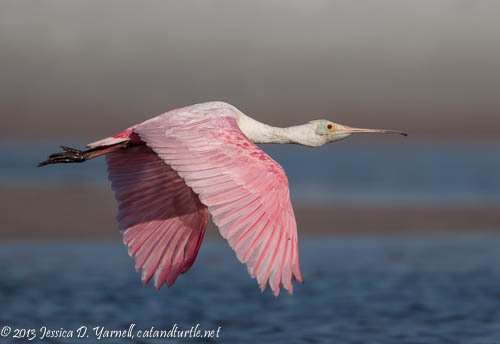 Pink and Blue – Female Roseate Spoonbill in flight. Fort De Soto. Spoonies are some of my favorite birds, and I spent a good deal of the morning photographing these while they stayed. They finally flew off, and my attention turned to some White Ibises who were also in the lagoon. They too were in full breeding plumage, with bright orange beaks and legs. Look at those bright blue eyes! 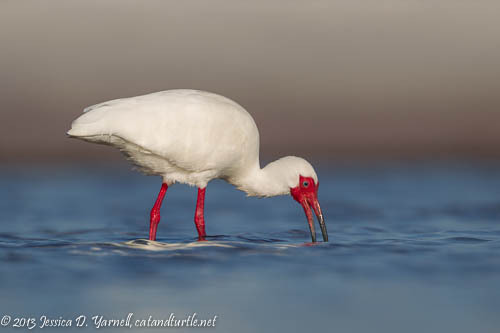 White Ibis – Gotta love the bright orange of his breeding plumage! Fort De Soto. 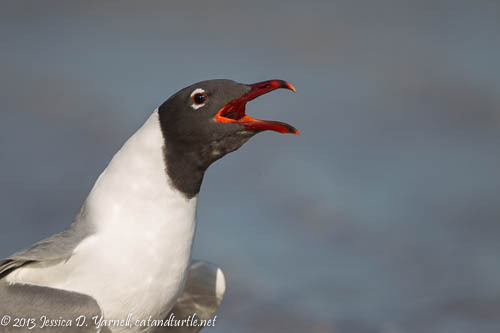 As I left, this Laughing Gull caught my eye. At this time of year, these guys roam around looking for prospective mates. If there hadn’t been so much wind, I suspect I would have seen lots of piggy-back rides. Maybe next time! I’m Ready! Does anybody else want to mate? (Subtle is not my strong point.) Fort De Soto.